Miami Heat guard Dwyane Wade recently completed his 15th NBA season and continues to try and excel on the court while serving as a role model off of it. 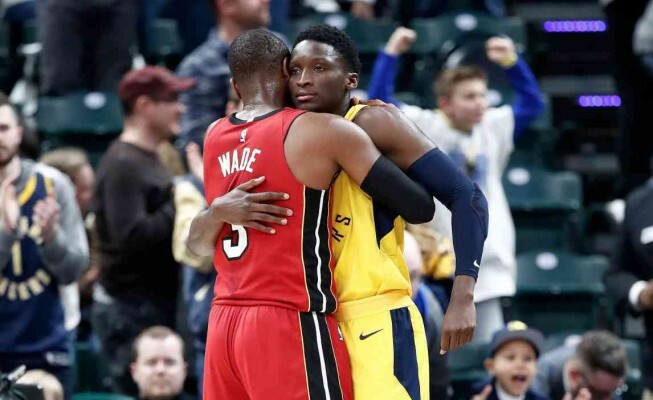 One player who took a huge leap with his play this past season was Indiana Pacers guard Victor Oladipo, who Wade has known since Oladipo was in high school and who he now believes can follow in his footsteps as a perfect representative for the league in the years ahead. The bond between Wade and Oladipo dates back to when the two first met at the White House for an event, with the lightly recruited Oladipo getting some interest from Indiana University. At the time, the Hoosiers were coached by Tom Crean, who had also coached Wade at Marquette University, and after Wade strongly endorsed going there to play for Crean, Oladipo chose Indiana. When he was drafted into the NBA, Oladipo finished second in the 2014 Rookie of the Year balloting, with his game often being compared to Wade’s. Oladipo would later be traded to the Oklahoma City Thunder before then being dealt to the Pacers as part of the Paul George deal last summer. Since that first connection, Wade and Oladipo have spent time working out together during the offseason, with Wade offering cogent advice along the way. This past season, Oladipo had a breakout campaign, playing a key role in pushing the Cleveland Cavaliers to a Game 7 in the first round of the NBA playoffs. Wade could announce his retirement during the offseason, but he appears ready to make sure that his role as one of the league’s most potent ambassadors continues with Oladipo in his place.